The last two weeks of 'summer break' have found me working hard! 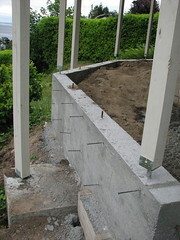 I poured a retaining wall using fifty 60 lbs. bags of concrete mix, poured a slab of concrete (4 yds.) and power washed a neighbor's roof for two days. The change of pace from the classroom is invigorating and I enjoy working outside in reasonably nice weather. However, when the end of August comes, I will be ready to get back in the classroom. Calvin left for Challenge (church youth conference) in Salt Lake City and Esther finally got to start her 'summer break' on Thursday.